Abandoned airport baby left beside heartbreaking note. Mother leaves heart-rending note with her baby after abandoning it at an airport. A woman may have given birth in the bathroom of an American airport before abandoning her baby beside a handwritten note. According to The Washington Post, an unidentified woman at the Tucson International Airport gave birth on January 14 shortly before 10pm, leaving her baby to be found by a rental car company employee. 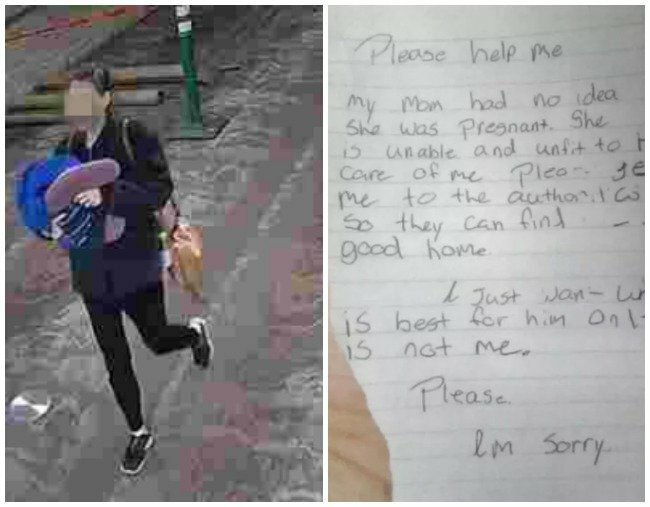 Authorities have since released a photo of the note left with the baby, along with CCTV footage of the woman they believe gave birth, in a bid to find the baby’s mother. Though found with a torn umbilical cord, the baby was in a healthy condition overall. In a statement to the Washington Post, airport spokeswoman Jessie Butler says the baby had since been transported to a nearby hospital and is in the custody of the Arizona Department of Child Safety. For now, authorities are determined to find the baby&apos;s mother. "We would like to know who she is but we&apos;ve exhausted our resources," Butler told The Post. According to TIME, Arizona is a "safe haven state". This means it is not illegal for mothers to give up their babies to unspecified authorities, including fire stations, licensed adoption agencies, or churches, up to 72 hours after the birth. However, airports are not listed as safe haven locations. Authorities are yet to confirm if, when found, the mother will face charges.